Us humans are facing an ever-growing health crisis. All the time you see headlines like World Faces Staggering Obesity Challenge, yet where does this get us? People are getting fatter and fatter. They are dying of preventable illness. Their quality of life is significantly diminished by the way they look and feel and as a society what do we do for them? It’s only in recent years that companies like Dove, with its Real Beauty campaign, and plus-size models like Ashley Graham and Tess Holliday have made it socially acceptable to not look like Kate Moss. Of course our definition of beauty is skewed towards tall, strong, chiseled, handsome men, and thin women, yet we all know that’s not what we are. And that’s all good. Our society measures us using the same stick, yet that ugly stick beats many of us down. We all come from a different mold, and what matters most is that we are good with who we are. A reason that plus-size (what does that even mean?) model Ashley Graham has become popular isn’t just because she more accurately reflects the “average” woman. It’s because she looks like Ashley Graham, and she’s good with that. Standing at 5’9, she’s about the same height as Victoria’s Secret angel Elsa Hosk, but with a 33 inch waist and 46 inch hips, she’s got about 10 inches more girth than the petite Swede. There’s of course no denying that Hosk fits our more traditional definition of “hot,” which attracts men and traumatizes women of all ages. “How you judge yourself!” I responded. What’s “Simpler” Than Losing Weight? You don’t have to be an expert on biology to see that the human machine more or less works on calories in and out. Sure, there’s plenty of nuances on weight, but the simple truth is that near-anybody can get into shape by changing inputs and outputs. So, why are we so fat, and only getting fatter? 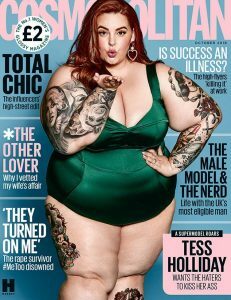 Why do the thousands of diets and exercise books fail our society? Because weight loss has NOTHING to do with our bodies, and EVERYTHING to do with our minds. Quite simply, there is nothing that your body can do on its own to gain or loss weight—“Its” shape is entirely dependent on what our brains choose to put in and burn off. In nature “no body” would choose to eat excessively and carry around excess weight, but in human nature it’s not our bodies that are in control, our minds feed the machine. Do a few minutes research and it’s unclear how effective TVs Biggest Loser has been. They certainly showed dramatic transformations. Some people got it back. Others kept it off. While the results are debatable, what’s interesting is their process. One thing I’m told they did well on the show was that they didn’t just put people through extreme dieting and exercise but they also got them counseling, so they could focus on the core of the problem—their minds. Wizards in my world can “easily” help people shed a massive amount of weight in a few hours! That’s because we’re not focused on the fat on their bodies, but on the patterns in their brain that keep them eating and exercising the same fat way. Change the brain, and the programming will take care of itself—the body will develop the new healthy eating and exercise habits that shed weight and keep it off. And while I’m making this sound easy, it requires a highly skilled operator, of which, truthfully, too few exist. Whereas counselors, therapists, trainers, nutritionists can come at it the same old busted ways for years, transformation requires knowing what is going on inside that head, and actually being able to change it. Men gain weight for lots of reasons, stress, anxiety, to feel “bigger,” loneliness, etc. being chief causes. With women you have the same family of causes, but it can often be more insidious in that many women suffer harassment by grotesque men—81% says NPR—which can lead them to gain weight to avoid that type of attention. No matter what the cause, it’s in the head. And that’s how you get to a different effect. So many things in our society are backwards that it often leads me to think our society has been deliberately engineered for suffering. Just like “Say No To Drugs,” which perversely normalizes drug use, the programming is busted, and hence every day more of us are saying yes. Pushing thousands of diet and exercise books as the solution to our weight problems has the same perverse effect. People feel shamed for being “lazy.” Guilty for eating poorly. Weak for knowing it’s “simple,” but being unable to do it. And these emotions only reinforce the mental patterns that cause weight gain to begin with. To truly address these problems in our society, we must start with the cause—nobody ever teaches us how to think and feel good.